Philippines - Malacanang Palace announced the 'No Classes, No Work' all throughout the country on Monday, October 6, 2014. President Aquino III declared the day as regular holiday in observance of Eidul Adha. 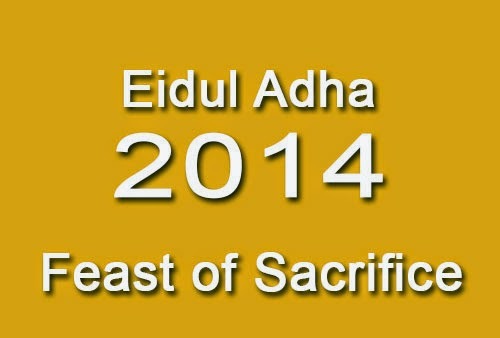 Eidul Adha is also known as Feast of Sacrifice for all Muslims around the world. This is one of the two greatest feasts of Islam. According to the National Commission on Muslim Filipinos, they choose observe the Eidul Adha on the 6th day of the month of October 2014. President Benigno Aquino, III signed the Proclamation no. 875 for the documentation on declaration of October 6, as regular holiday all over the Philippines. For more information about the Eidul Adha on October 6, kindly bookmark this page and share to your joined social networking sites. Comments or suggestions about "No Classes, No Work on Monday, October 6, 2014 - Eidul Adha" is important to us, you may share it by using the comment box below.